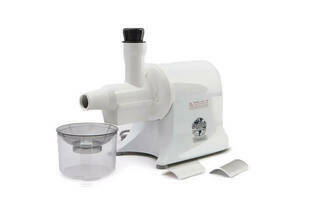 Can also be used to make fruit sauces, baby food, nut butter, ice cream, sherbets and fruit smoothies. Narrow chute size so produce needs to be cut into small pieces. Juice can drip from the spout. Strength needed to remove cutter. Rubber feet may leave mark on the bench. Pulp can accumulate around the filter and inside chute. I HAVE OWNED A CHAMPION JUICER FOR THE LAST 25 YEARS OR SO AND IT HAS NEVER LET ME DOWN. JUICING IS EASY AND I OFTEN USE IT, MAKING LEMON JUICE FROM THE WHOLE LEMON IS A REGULAR OCCURRENCE ALSO CHILLIES,ONIONS,GARLIC AND GINGER,WHICH IS HARD WORK FOR THE MACHINE AS THE FIBERS ARE TOUGH. THE FILTER NEEDS TO BE CLEANED REGULARLY AND JUICE CAN OOZE FROM THE REAR.